Note: The microphone visible in this video is turned off. My usual stereo miking is in place just out of the frame. The original video of the NAMM prototype I reviewed in January was ruined due to technical difficulties. Maury’s Music kindly provided a production run 00-28 to make this video at their studio in Coaldale, Pennsylvania, later in the year. The new 00-28 features Martin’s 00 grand concert body size, made in Style 28 for their Standard Series of professional-level guitars. It is constructed by hand from all solid tonewoods, with a high-gloss nitrocellulose finish on the top, back and sides, and a satin finish on the solid one-piece neck with a traditional dovetail neck joint, solid mahogany neck block, and two-way adjustable truss rod. 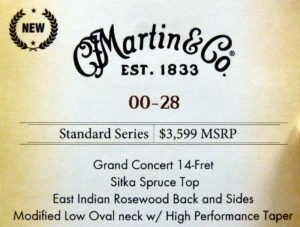 Following the success of last year’s 00-18, which returned the 14-fret grand concert size mahogany guitar to the Standard Series, Martin has followed up with the rosewood version, the 00-28. And boy, was it worth the wait. As with the 00-18, this new 00-28 has impressive ratios of responsiveness to power and resonance to definition, but with the addition of rosewood’s rich harmonic complexity. The scalloped 1/4″ Sitka spruce bracing has been proved ideal for a Sitka spruce soundboard with the 00 width. I just can’t get over how wonderfully successful these little powerhouse guitars turned out to be. As with the larger 28s made with Indian rosewood behind Sitka spruce, the 00-28 has strong, fat fundamentals, with the unwound trebles ringing like steel hammers on an anvil, as the wound strings punch into the room like brass knuckles, yet rooted in a cellar of warm, moist, resonant undertone. But when I lay off and relax into my playing, the precise and slender purity of the high e and b strings is breathtaking. And the mid-range strings likewise relax their punchy pop and hum pleasantly above the woody presence permeating that three-dimensional tonescape. Singing with silvery purity up high, commanding mids, and full-bodied lows, all riding atop the lush and lovely depths saturated with what I call that “smoky rosewood presence,” the new 00-28 provides classic, nay even legendary Martin guitar tone. It is a worthy addition as it takes its place alongside the D-28 and OM-28, and the new Grand Performance size 28s in Martin’s revitalized Standard Series. Where the 00-28 differs most noticeably from the larger 28s is in how the bottom end stays more in line with the rest of the voice. The fundamental from the low E string is thicker and denser than that of the A and D strings, but remains more compact and defined compared to a 000 or OM. And it does not throb so much as report with firmness. Its sonic mass does not force the resonant undertone to well up and overflow into the fundamentals, at least not to the same degree one hears from larger guitars. I expect that players who are looking for a smaller body, but used to Martins like the D-35 and D-28, will enjoy how this guitar differs in sound. Because the bass stays in line with the other registers, it keeps the voice balanced by centering things in the midrange. And it puts the emphasis on the fundamental notes from the strings. But others will feel it is lacking the kind of dominating bass they are used to, and may be happier with one of the rosewood 000s, OMs, or Grand Performance guitars now offered throughout the Standard Series. For myself, I am nothing but seriously impressed with how successful the 00-28 is in terms of versatility and dynamic range in such a comfortably small size. Really, a 14-fret 00 is not all that small. It just seems that way compared to the kind of guitars named after battleships and elephants. The body of a 000/OM Martin is but a half an inch longer and 11/16” wider in the bottom bout. They even share the same depth. Still, the slightly smaller body does have less cubic inches of air inside the sound chamber, so it is not as loud and does not have as much bass response. But it also brings the headstock that much closer to the player, even more so if you are talking about the short-scale neck vs. the long-scale neck on an OM. And that does translate into a more comfortable experience, when it comes to repetitive stress upon one’s joints and digits. The angles of attack just aren’t as extreme. 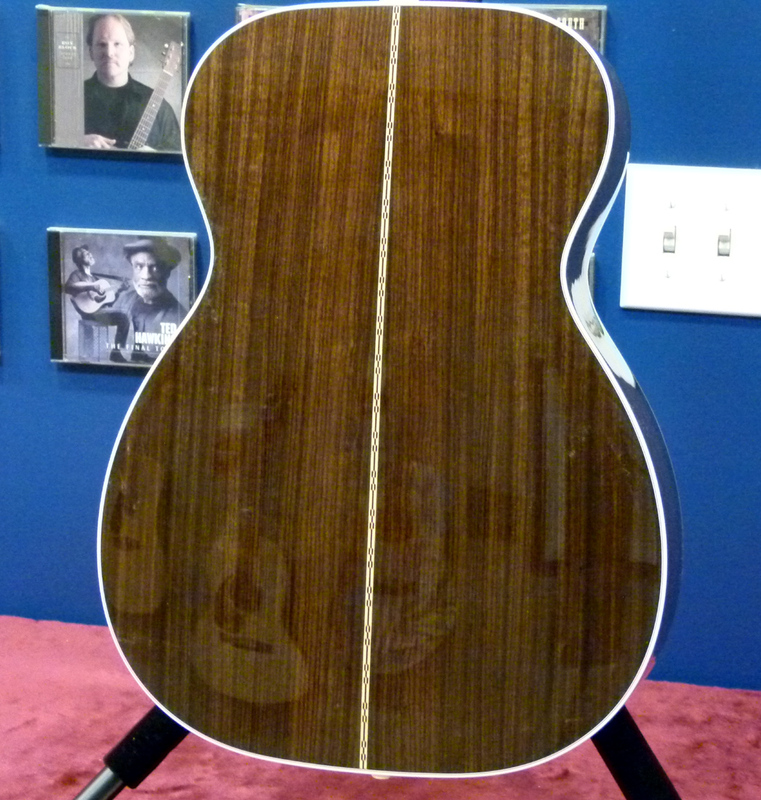 The short-scale neck has the frets set a tad closer, which is most noticeable as one gets nearer the soundboard. But in general, chord shapes and stretches across multiple frets are likewise easier on the hands. And the slightly reduced string tension makes for much easier bending. In fact, with light gauge strings, the full-step bends normally reserved for electric guitars can be achieved. This model comes with Martin’s High Performance neck, which matches their roundish Modified Low Oval profile with a fingerboard taper that starts at 1-3/4” width but is 2-1/8” at the 12th fret, just like their 1-11/16” necks. This means there is a little extra room out in the cowboy chord area, but one does not have to grapple with a wider fretboard when playing leads in the upper frets. Personally, I find the short-scale version of the High Performance Neck to be the most comfortable and satisfying. 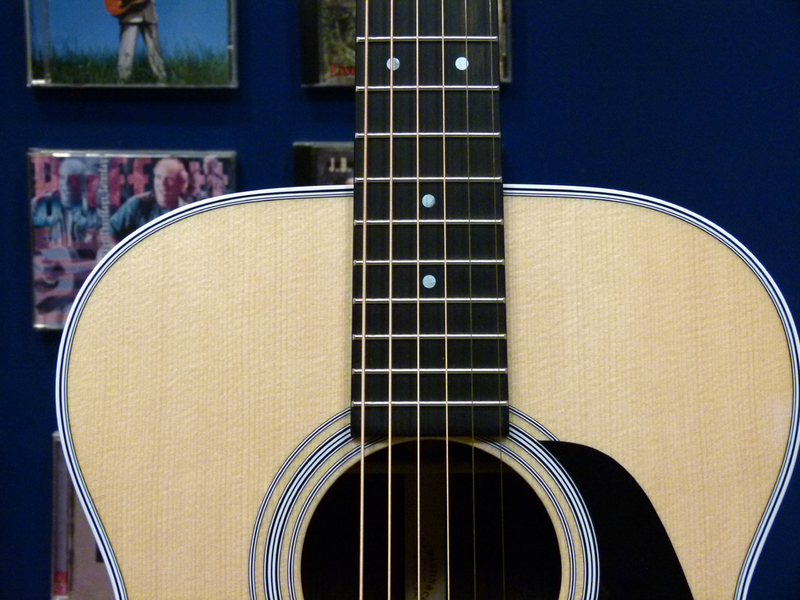 Martin introduced the original 12-fret 00 size in 1873, the same year that C. F. Martin Sr. passed away. C. F. Jr. had been running the company for some time and heeded the demand for a guitar larger than anything his father had imagined when he first sailed to the USA in 1833. Where the recently introduced 0 size was thought large enough to perform a public concert, the 00 was intended for the touring professional who frequented halls and theaters large enough for a grand concert. And the original 12-fret 00-28 became the mainstay ship-of-the-line at the heart of Martin’s fleet for the next half century. The 14-fret 00-28, on the other hand, has ever and always been a very rare bird. It is likely they have already made more 14-fret 00-28s in 2017 than in the entire history of the Company. The moment I played one, I could not help wondering why they haven’t been making and selling bushels of them all along. But the fact is, by the time Martin converted their main line to 14-fret steel string guitars in 1934, the Dreadnought and 000 size were clearly the future of Martin Guitars. Bigger was better in the eyes and ears of the American public at that time. And 0s and 00s became specialty items for the folksingers and fingerpickers who valued balance over bassiness and comfort over ka-boom. Where fifty-five 12-fret 00-28s were built in 1931, its last year of production, only five 14-fret 00-28s were made in 1934, its first year of production. Another eleven were made between 1935 and 1941. One was produced in 1958, one in 1977, and two in the 1984. According to the production sheets, that’s it. 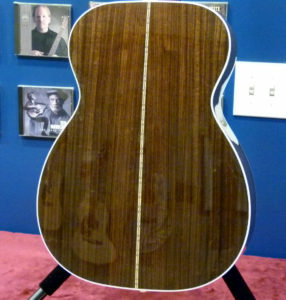 There have certainly been more Custom Shop rosewood 00s made since then. And today we have the first cataloged example in a very long time. 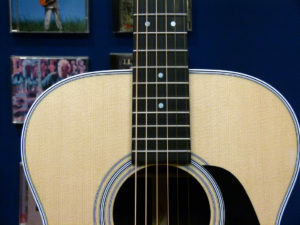 Martin has recognized that smaller acoustic guitars are becoming much more popular than at any time since they instigated the 14-fret steel string guitar revolution nearly 85 years ago. Have you noticed how small are the Martin guitars Ed Sheeran is using to rock the entire world these days? Whereas tiny guitars may be on par with the ukuleles out there among the contemporary troubadours, when amplified, they do not put out much in the way of acoustic dynamic range when not plugged into large sound systems. 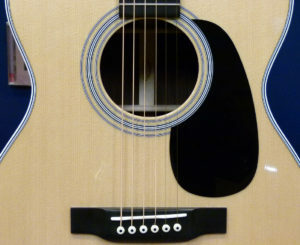 The 00-18 and 00-28 provide a fully realized acoustic guitar experience with enough bass, projection, and volume for self-accompaniment or fronting a band, while still being small enough for easy portability and comfortable playing on a sofa or camping trip, and are manageable by the most petite players without being too small for the Goliaths of the music world, when it comes to playability. I advocated for Martin to put scalloped 1/4” bracing on their short-scale auditorium size 000s for decades before they finally did. 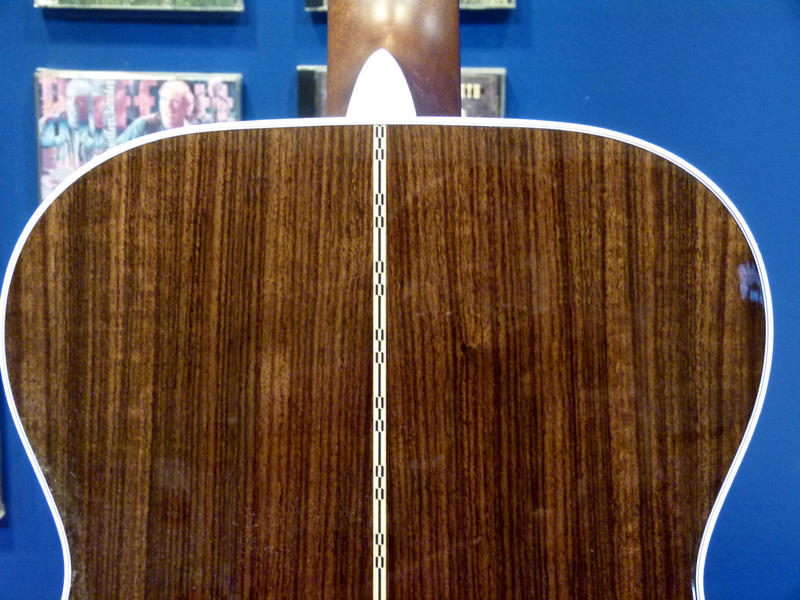 I am now convinced that the specific soundboard area provided by the grand concert 00 size is Goldilocks’ “just right” for the 1/4” scalloped bracing made from Sitka spruce that Martin is putting on short-scale guitars today. While the difference in volume and bass response is noticeable when played side by side with a 000, many people will be mightily impressed with how much power and personality exudes from these new 00s. There is something about how they broadcast such resonant tonal riches with so little tension or effort on the part of the guitarist, and in how they retain so much articulate definition from the actual strings when played with vigor, that they are a simply marvelous. If one has an ear for mahogany, the 00-18 has already shown what a fine guitar it is. But for those who love the chocolate cake richness of East Indian rosewood, with that fresh coffee darkness in the undertone, and the kaleidoscope complexity in its harmonic overtones, topped with warm, powerful Sitka spruce, well then, the luscious sound produced by this combination of tonewoods, in this body size, with the short-scale neck, and the light and lively bracing, will make the most basic back porch noodling sound like a grand concert indeed.